More than two minutes and 40 seconds of a special version of “I Gotta Feeling” recorded by the Black Eyed Peas to honor Oprah Winfrey plays in this “team” promo for a matrix-cycler “program” known as “Diamond Holiday Feeder.” Neither the group nor Winfrey is credited. Source: screen shot from DailyMotion.com. 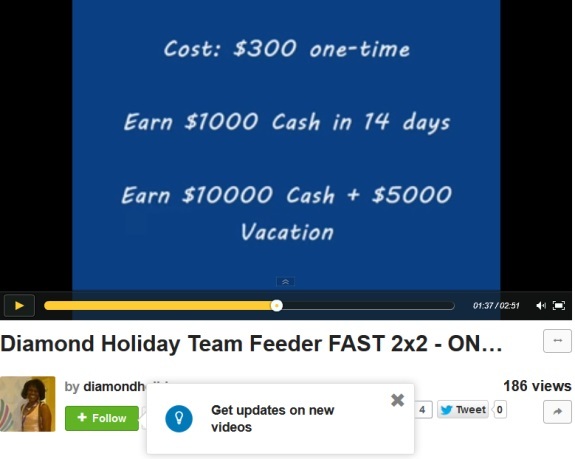 The Gmail address used by TelexFree figure Faith Sloan in a Sept. 23 DMCA takedown notice filed against BehindMLM.com appears below a 2010 video promo for a “program” known as “Diamond Holiday Feeder,” part of a larger “program” purportedly engaged in the travel business while also operating a matrix cycler. Matrix cyclers sometimes are known as 2x2s or “get two who get two.” MPB Today, a collapsed matrix cycler that led to racketeering charges in Florida against the “program” operator, is an example of a 2×2. Another example is Regenesis 2×2, which led to a U.S. Secret Service probe in Washington state in 2009. Another Sloan video for a “team” build of the Diamond Holiday “program” uses nearly three full minutes of a special version of “I Gotta Feeling” recorded by The Black Eyed Peas to honor Oprah Winfrey and the 24th year of The Oprah Winfrey Show in September 2009. Neither Winfrey nor the group is credited in the “team” promo. The “team” build video is dated March 21, 2010. Ironically, Sloan has accused BehindMLM.com of copyright infringement, amid allegations it used photos to which she owned the copyright on its website. BehindMLM.com says Sloan’s claims are bogus. In the current TelexFree case in which she is accused of securities fraud, Sloan likewise is blaming management. Sloan’s narration in the April 2010 video shows her Diamond Holiday Feeder back office and suggests she did not withdraw her purported earnings of $10,000 all at once to her bank account, but rather in smaller increments. Such a practice may lead to questions about whether she was engaged in structuring transactions to avoid bank-reporting requirements. In a civil action against TelexFree in April, the Massachusetts Securities Division raised the issue of structuring. Other information suggests Sloan gravitated to Diamond Holiday Feeder after the collapse of the Noobing MLM scam in 2009. Noobing, in part, was targeted at people with hearing impairments, including a California woman the PP Blog interviewed in 2010 through her interpreter. Noobing was under the umbrella of an enterprise known as Affiliate Strategies Inc. that was running a government-grants swindle and was sued by the FTC and three state-level attorneys general for fraud. ASI went into receivership, taking Noobing with it. The enterprise had offshore conduits in Belize and Nevis. On one August day in 2009, attorneys assisting the ASI receivership “received thirty two US Mail crates” filled with complaints from scam victims, receiver Larry Cook said at the time. “The Receiver’s work over the past three weeks suggests the Defendants’ operations were insolvent on the date [July 24, 2009] the [Temporary Restraining Order] was entered and that for at least all of 2009, Defendants operated only by signing up new victims faster than the old victims could obtain refunds,” Cook said at the time. Great sleuthing Patrick. I’m aligning my sights towards Phaith at the moment and am working on some additional verification prior to release.